Solid state Lighting LED technology combined with pure structure, together with a tinge of fantasy, still positions kissimu 3 in the avant-garde of high power LED designer lamps. 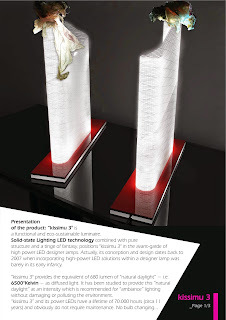 In fact its conception and design dates back to 2007 when incorporating high-power LED solutions within a designer lamp was barely in its early infancy. “ kissimu “ 3 is a functional and eco-sustainable luminaire. Its photometrics define it as such; it provides the equivalent of 900 lumen of “natural light” at 6500 degrees Kelvin of indirect light following the norms and guidelines of non-polluting lighting standards within a given environment. Furthermore it has been studied to provide “natural daylight” at 6500K at an intensity which is adequate for “ambiance” lighting. “kissimu 3” and its power LEDs have a lifetime of about 70.000 hours and of course, as all Solid-State Lighting does not require maintenance. The kissimu 3 table lamp goes beyond the pre-conceived idea of a table lamp. Its fluid design gives a sense of “taking off” and a feeling of lightness. It is true ambiance lighting respecting and promoting a thoroughly relaxing and sustainable feng shui. “kissimu 3” find itself comfortable in a very linear and zen-like environment. "kissimu 3" has a touch on/off electronic device incorporated at its base offering the possibility to have only one part of the luminaire switched on or both.